A patient has been diagnosed with cholera in the Cuban capital, Havana, days after three people died in a rare outbreak in the south-eastern town of Manzanillo. More than 50 people were infected and about 1,000 have received medical attention. The authorities say the outbreak is under control but four hospitals are prepared to isolate patients. They say people became ill after drinking water from contaminated wells. But it is not clear what the source of the cholera is. Most of the cases were in Cuba’s south-eastern Granma province, more than 750 km (470 miles) from Havana. 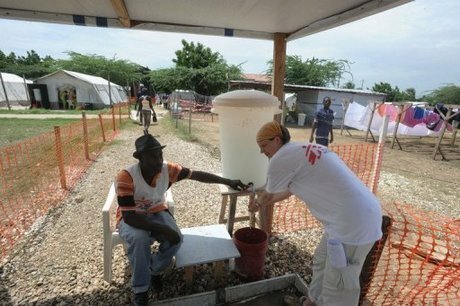 Hundreds of medical professionals from that area, including nurses, have worked and continue to work with patients in Haiti, where tens of thousands of people were infected after a devastating earthquake in 2010. For over a week doctors in Havana have been doing the rounds of their patients, checking for symptoms of cholera. The infirm, elderly and pregnant have been prioritized. Now tests on a 60-year-old woman, admitted to hospital on Wednesday, have confirmed that she has the disease. As she was diagnosed early, doctors say she is in a stable condition. They said they had taken a series of measures, including taking samples of water and adding chlorine to purify it, to combat the outbreak. Cholera is a bacterial infection that can cause severe diarrhea and dehydration. The Health Ministry said the last reported cholera outbreak on the island was soon after the 1959 Revolution.